I use quinoa in recipes all the time but this is the first time I’ve added this powerhouse to my baking repertoire. 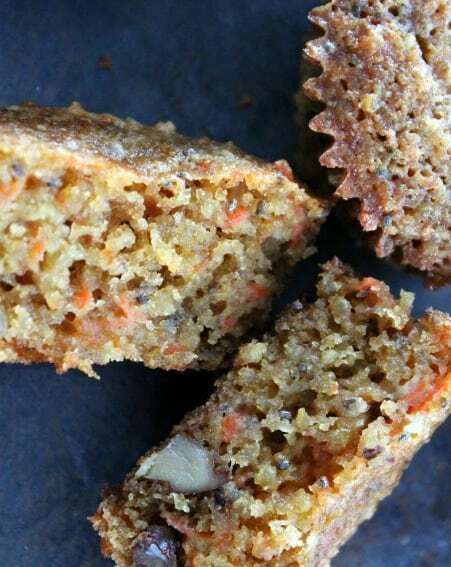 The quinoa in these carrot and quinoa muffins makes for a nutritious and protein-rich snack, and also rewards you with a crunchy pop in every bite. 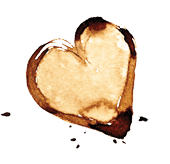 I can’t wait to add more quinoa baking recipes to my cuisine, so let me know if you have any favorites! In this recipe we also have coconut oil. Besides being a healthy fat, coconut oil is very subtle but adds the right hint of toasty sweetness which combined with the nutty almond flour only increases the wow factor of these muffins! Try to bake these in foil muffin tin liners (paper lined) as the combination of the coconut oil and yogurt makes the moisture almost ooze out of the muffins. I’m a huge fan of carrot cake in general, but these are much more than just your basic carrot cake snack. So, if carrot cake is not your favorite, don’t leave me! The carrots play a delicious part in the recipe without stealing the show. All the flavors and textures combine to make take these muffins over the top! Try to bake these for the maximum time so the tops get a little crispy around the edges. And if you can keep them around for more than a few seconds, the flavor just gets bigger the next day. You really must make these muffins! I had to experiment with the recipe to get the right combination of texture and taste. This is it. Enjoy! Note for my vegan friends: Vegan substitutions are included in the recipe below. This recipe can be stirred together without the use of a mixer. Do not skimp by replacing the almond flour with all-purpose. The almond flour gives these muffins an amazingly airy texture. Cook's note: I have started replacing the yogurt with applesauce for a dairy-free option and these muffins are equally as delicious with this substitution. * Vegan substitutions: For the eggs substitute 1/2 cup applesauce + 2 teaspoons baking powder. For the greek yogurt, substitute 1/2 cup soy or coconut yogurt. Preheat the oven to 350F. Line a muffin tin with foil liners and set aside. Melt the coconut oil and set aside. In a large bowl, stir together quinoa, sugar, coconut oil, Greek yogurt, vanilla and eggs, carrots and walnuts. In a separate bowl, sift together the flours, baking soda and salt. Add chia seeds now, if you're using them. Stir the dry ingredients into the wet ingredients, mixing until fully incorporated, but don't over stir mixture. The muffin batter will do one of two things; it will either have about the same consistency as pancake batter or it will be kind of thick like brownie batter. This depends on whether your coconut oil hardens back up upon mixing, which may happen depending on the temperature of the other ingredients. Either consistency is right so don't worry if it's runny one time and thick the next. Fill the muffin tins about 3/4 full. Bake 18-20 minutes, until the tops are a nice golden color. Recipe adapted from Garden of Eden. Nutrition info per 1 muffin: Calories 198, Tot. fat 9.5g, Sat. fat 5.7g, Chol. 21mg, Carbs 27.5g, Fiber 1.4g, Sugar 10g, Protein 4g. Finally made these this AM………..very good! Perfectly moist with a light consistency. Used only 1/3 cup coconut oil and used 1/2 cup coconut sugar, instead of the 3/4 cup brown sugar the recipe calls for . I think the 1/3 cup of coconut oil was perfect! But, next time I will use more sugar, since coconut sugar is less sweet than brown sugar. I also added 1/2 t cinnamon to the mix. I filled the muffin cups full and got 13 muffins. My bake time was 30 minutes.. Thank you Ruth! I had just this moment added these muffins to a list of items I need to make tomorrow for someone. I’ll try it with the 1/3 cup coconut oil as well. Glad you liked them, thanks for taking the time to comment. So I took eggs out of the fridge and put them under some warm laundry to get them to room temp ? but totally forgot to put them in the batter and my muffins came out delicious!!! They were so moist. Bad mistake, awesome result. I will definitely try adding the eggs next time though. these turned out fabulous!, very light and fluffy, I ran out of my honeyville blanched almond flour and I had slivered blanched almonds in the freezer so I ground those up in my vitamix for the almond flour, also used organic coconut sugar, organic greek vanilla yogurt, and in place of the whole wheat flour I used organic spelt flour. I threw the almond flour oil eggs and yogurt in the vitamix to make sure it was very light, since some people were saying they fell, I also toasted walnut and added raisins, very good made a double batch since I cooked such a big pot of tri color quinoa, also for the carrots since I hate shredding I peel and chunk them up in my vitamix and cover with water and on a lower setting grate them up nice and fine, strained off the carrot water for a soup or something. These sound absolutely delicious, Sally! Thanks for recommending them. I love using coconut oil in baking, and am a huge fan of healthified breakfast / dessert ideas, so these are right up my alley! Was just wondering if the yogurt can be omitted in general. I absolutely love these! I didn’t change a thing! My daughter loves to help sift the flours so she gets excited when she sees these in the making they’re a regular now at our house. They’re in the oven! My 1yr old LOVES these! Thanks for your great ideas. My family has a sweet tooth. I love these but the kids don’t want to eat more than 1. (Fine with me!). But after being in the fridge a couple of days, the carrots start turning green. Do you think it’s just the combo of ingredients, being cold, that causes that? Do you refrigerate yours or leave them out in a sealed container? We LOVE these at our house! I make them with/for my 4 and 2 year old. I would like to bring them to their school to share, but we are a nut free school. What do you suggest I substitute for the almond flour? Do you think coconut flour would be good? Thanks! Hi Robbie Jane! I am making these tonight AGAIN for a fabric sale I’m having tomorrow. They really are delicious for everyone, right? Now on the flour substitution… I LOVE coconut flour but it is very dry. I have actually been experimenting with this recipe using some coconut flour in place of the all purpose for a gluten-free option. In this case, if you replace the almond flour with coconut flour, try adding an extra egg and if the batter still seems dry, add enough milk or coconut milk until you get the pancake batter consistency you’re used to with the regular recipe. You could also make them with just using all-purpose flour and they’re good but not as over-the-top tasty as with the almond flour. I might not be must help here. Good luck! Let me know how it goes and thanks again for your great comments. LOVE these for my 2 year old. I leave the sugar out and make mini muffins for her to take to daycare. 10 mins at 350 for anyone else interested. Thanks for the awesome recipe!!! Crystal! I can’t tell you what it means that you make one of my recipes to send with your precious child every day. I send them in my 11 year old’s lunch a lot too. They are a great source of protein. I am going to make them without sugar and try the mini muffin size next time. Thanks for the instructions on those. Hi Pam, I am a huge fan of coconut flour but it is very dry compared to almond flour. So, if you’re going to use it in place of the almond flour, maybe decrease the amount of coconut flour and increase the amount of whole wheat flour. I’ve never used it in this recipe, though, and these muffins are amazing as written. So, if you do replace the almond flour with coconut and aren’t happy with the outcome, try it again another time with the almond flour. Let me know how it goes! Thanks for the recipe it’s delish I made a few of my own alterations that I’ll share. I used oat flour in place of wheat flour. I make my own almond flour and I also made my own oat flour easy to do if you have a vitamix also more cost effective. If you use gluten free oats then it would be a gluton free muffin. I would also use quinoa flour and pecan flour in this as well. I cook my quinoa in almond milk instead of water. Always do this when I’m using quinoa in a sweet recipe, otherwise I cook it in a broth. I added cinnomon and next time I will cut back on the brown sugar and on the coconut oil and add some crushed pinapple instead. I added chopped pecans and added white chocolate chips to a few of them that I had left in the cupboard. They came out delish! Thank you! Wow! These came our delicious! I was searching for healthy muffin recipes I could feed my toddler for breakfast and this one passed the test for flavor and health! Loooove them!! I have to admit I was skeptical at first, but you’d never guess this muffin was packed with quinoa and whole wheat flour! Thanks for an amazing recipe I will share with all my other mommy friends! These are absolutely delicious! My nanny started making them for our toddler and now we make them and go through a batch in just a couple of days since we can’t stay away from them! The only variation I have done is subbed walnuts for raisins and used honey greek yogurt instead of plain. These are a keeper, yummy and healthy, to boot! Kelly, I always use honey Greek yogurt in mine, too! I’m glad you all like them and thanks for your comment. I’ve made these a few times. I’m on a “no bread” diet. Instead of using flour, I ground up oats and used that as flour. It works very well for me. I have made these a few times now and they are a hit! Just wondering if you have attempted the gluten free version yet? I’m not sure whether to try all almond flour, or mix in a different kind of flour instead of the whole wheat. I’m meeting up with a few friends in a couple days, one of whom is Celiac, and I would love to bring these muffins but a GF version so everyone can eat them! Hi Rebecca, I still have not had a chance to make them gluten-free, but a few posts below someone said she has made them using a gluten-free blend with success. I have a recipe on my site for blueberry coconut muffins that are gluten free, but they use only coconut flour in the recipe. I am not sure if the almond flour has enough substance to ONLY use it in the recipe, you know what I mean? What if you use the amount of almond flour called for in the recipe and then substitute the all purpose flour for a gluten free blend or coconut flour if you’re able to get that. The coconut flour has an amazing flavor and texture. Thanks for the freezing information, I’ll definitely be trying that. These have quickly become a family favourite, and they are a regular in my muffin rotation! I grind up almonds in my old coffee grinder to make almond “flour”, and use whatever flour I have on hand – spelt, gluten-free blend, etc. They have always worked, and we love them. Thanks! It sounds like your family likes these as much as mine. Good to know that a variety of different flours have worked for you. I’m about to make them completely gluten-free myself so I appreciate this input. Thanks for the nice comment. Oh thanks, I totally overlooked that info. These truly are addicting. I just made these and they turned out GREAT! I did add 1 1/2 t. cinnamon 1/2 t. allspice and 1t. nutmeg, really had lots of favor. I just was wondering if anyone knows the calorie count of each muffin? Hi Coleen, the nutrition information is listed at the bottom of the post under the printable recipe. These look great. I can’t wait to try them. I am wondering though, can you taste the quinoa? I love it, but my husband isn’t the biggest fan. I try to to sneak it into recipes when I can; such as salads and casseroles. Thank you! Can’t wait to try them! Hi Cathi, I have not made this totally gluten free yet. But I will test it next week and post the gluten free options for you. Janet, thanks for your comment. We love them too! Hmmm… wonder if a little cream cheese frosting slathered on top would be too much. what could I use instead of brown sugar? I eat clean and these muffins would be fabulous..I just can’t have the brown sugar.. Thanks for the recipe!! Can’t wait to try this out! I’ve never baked or cooked with Quinoa can you please tell me how you cooked the quinoa for this recipe? Thank you! I just did this recipe and it turned out more like cookie dough than cake batter. I followed the recipe with everything but there is something missing to make it like batter. I had to spoon the “dough” out on a cookie sheet to make cookies instead of muffins. Sally do you add 1/2 cup of honey plus 1/2 cup of yogurt, or just one? Taylor, I add 1/2 cup of honey FLAVORED Greek yogurt. Not honey and yogurt. I see now how the instructions can be misunderstood. I just changed it. Thanks for the question. These muffins look absolutely delicious. I’m gonna try making them but I would like to get rid of the sugar. Any recommendations on substitutes or can I just simply leave the sugar out? Emelie, I would try them with the sugar left out. They should be sweet enough between the coconut oil and yogurt. I use Greek Gods Honey yogurt sometimes when I make them. It does have evaporated cane syrup and the sugar content is pretty high (33 grams). Try their plain yogurt which has no added sugar and 15 grams of sugar per serving instead, if you like. Let me know how they turn out. Either way, I’m with you and will be testing them soon myself with no sugar. Hi Jennifer, these are yummy and we too are trying to go gluten free this year (or at least gluten light). Let me know what changes you make and how they come out. The original recipe is with all whole wheat flour and no almond flour, so I felt comfortable changing to half and half. They don’t rise much as a result, which is just fine with me. Also, as I mention in the recipe, they will be even more tasty the next day. Thank you! How about cranberries VS carrots? Sorry I didn’t clarify better. I am going to try this recipe with cranberries TODAY! Thanks for visiting and taking the time to comment. I just whipped these babies up! Delicious! My boys are devouring them! Chelsea, my friend! Wow, I’m so glad you took the time to make these while you’re probably super busy with 3 little cutie pies! Glad you liked them. We love them here. These look great. How can I make them wheat free. Would all purpose gluten free flour work instead of white or wheat flour? Do you have any suggestions. These were good, but a little bland. Any suggestions for bumping up the flavors? Maybe next time I will add a dash of cinnamon. Hmm, if you want to spice them up, adding maybe a teaspoon of cinnamon would definitely do it. Let me know if you do, I’d be interested in how you like that. Thanks for your comment! Amanda told me about this recipe, and I can’t wait to make them!!! Thanks! Maybe it is just the way that my body responds to coconut oil, but they were too rich for me. My toddlers loved them though! Sorry to hear that Tania. You could substitute canola oil next time. Thanks for the feedback. Do you think I could use the leftover carrot pulp from juicing in this recipe? Definitely. 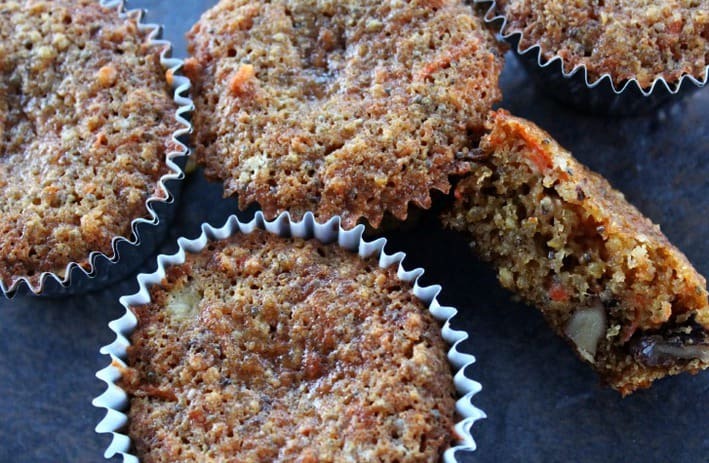 This might be a perfect recipe for using carrot pulp since the other ingredients add a lot of moistness to the muffins. Let me know how they turn out, Tamika!